NASA has begun counting down toward the planned predawnlaunch of the space shuttle Endeavour on Sunday. 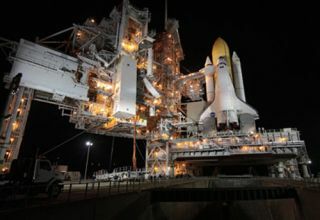 Endeavour is poised to blast off from the Kennedy Space Center in Floridaon Sunday morning at 4:39 a.m. EST (0939 GMT) to deliver a brand-new room andobservation portal to the International Space Station. ?The clocks beganticking down toward launch time early this morning. ?We?re right on schedule, where we?re supposed to be,? saidNASA test director Jeff Spaulding during a Thursday status briefing. There is a 70 percent chance of good weather for Endeavour?slaunch. The potential for high winds is the only concern, shuttle weatherofficials said. Commanded by veteran spaceflyer George Zamka, Endeavour?ssix-astronaut crewplans to fly a 13-day mission to deliver the space station?s new Tranquilitymodule and a seven-window portal called the Cupola. Tranquility is named in honor of NASA?s historic Apollo11 moon landing site and will house vital life support equipment, exercise gearand a robotic arm work station. The Cupola is a long-awaited window fixture thatpromises to give astronauts their best view yet on space and the Earth below. Three spacewalks are planned to install the station?s newadditions, which will leave the $100 billion orbiting laboratory nearlycomplete after more than 11 years of construction. NASA hopes to loft the shuttle mission on schedule toclear the way for the planned Feb. 9 launch of an unmanned rocket carrying thenew Solar Dynamics Observatory, a sun-watching probe, into orbit. Endeavour?s upcoming launch is the first of NASA?s fivefinal shuttle missions before the shuttles are retired later this year. It is expectedto be the last shuttle flight ever to liftoff at night since the orbiter fleet began launching in 1981.